This kit is only compatible with Laser printers, if you have an Inkjet printer, see our 25 Card ID Kit for Inkjet Printers! 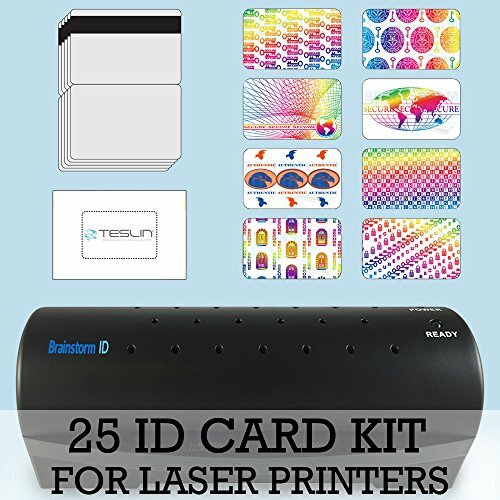 This 25 ID Card Kit includes everything you need to make 25 ID Cards, all you need is a laser printer! Only $4.19 per ID! This kit includes the Brainstorm ID-Lam 45 laminator. This laminator is more than capable of providing the proper amount of heat and pressure necessary to make a professional ID card. Also included are 5 sheets of micro-perforated Laser Teslin paper (enough for 40 ID cards to allow you room to work), 25 gloss butterfly pouches (7 mil thick), and 25 "Authentic with Seals & Keys" hologram overlays.